All songs can be previewed as 30 second cuts. All-New slideshows & videos: Check them out! 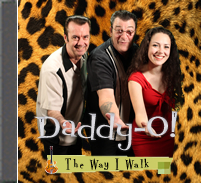 Visit http://www.wewecanrecords.com/ or http://cdbaby.com/cd/daddyo22 where you can listen to clips from all 25 tracks. You can also order the full CD there as well as any individual tracks for your mp3 player. "Crazy Little Mama" is now available. Visit Wewecan Records for more info and to purchase online. Individual songs can also be purchased on iTunes, Amazon & DFjams. "Starlite Drive-In" 16 great songs from the fifties, including radio airplay hits: "Summertime Blues" & "Be Bop A Lula"
slideshows & videos Check it out!
" Take real good care of each other!" - R.C. Daddy-O! and/or Blues Alley at an earlier time on the websites.